Pyramid. One of the most stable structures in the universe. With a broad base it is very difficult to topple. So how can you take this concept to the world of leadership? It starts with you and your ability to exhibit the traits you want to impart on the culture you are creating. If you want to create a culture of honesty and openness you need to be open, honest and trustworthy yourself. If you want your team to follow up on promises and get things done, then again you need to exhibit, live by and belief in these values yourself. Your values and principles are the tools you will use to build the rest of the pyramid. If those tools are broken, or unknown to you, then you cannot expect to build a solid product on top of it. And we are not talking about fulfilling promises you give to others, but rather fulfilling promises you give to yourself. Being honest with yourself, trust in your own opinions and abilities. Knowing that when you say to yourself “I will do this,” you will actually do it. Life is about communication and relationships. How do you relate to others around you, being it your family, friends, colleagues, customers, is defining the outcomes. 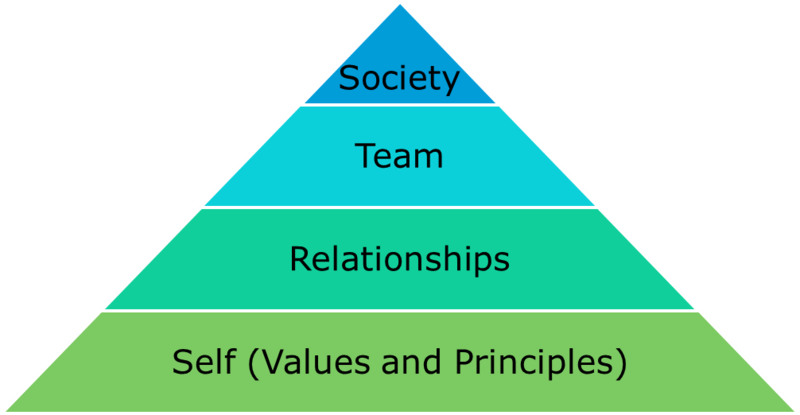 This is the part of the pyramid where your internal values exhibit externally. This is where promises given to others should be fulfilled, where you create an image of someone who is trustworthy. If people around you cannot understand what you want, expect, need, or if they don’t know what your values are and if you are unpredictable, they cannot trust you and will have hard time following you. You cannot build the rest of the pyramid if the basic interactions between the stones, the relationships, are broken. This is your role as a manager. If you have made a pact with yourself, you have well set relationships with people around you, you can then build and lead a team. The values and principles that guide yourself and your interactions with people around are also a good basis for building a team. People already know the framework set by the relationships so it should be relatively easy for them to form a group that works towards the common goal. Your task is to make sure that the team lives the basic set of values and understands the principles. If there is someone on the team whose values are against the common goal then chances are he/she won’t last long. If more people are getting lost and struggle with the values upon which the team is build it is your task to educate, guide and explain how the underlying values transform into everyday job. The last one is your place in the universe. People who are happy have very often managed to align their personal values to the values of the environment. They are happy with the way their family lives, they participate in the work the local community does and they believe in the mission of the company they work for. This total alignment is what makes the whole pyramid indestructible. On the other hand if the values of your company contradict to who you are chances are that whatever you do and whatever amount of energy and flexibility you spend you will never feel truly at home and you will never be able to utilize your whole potential. What are your basics of leadership? What is the single most important aspect without which you cannot have a solid leadership?